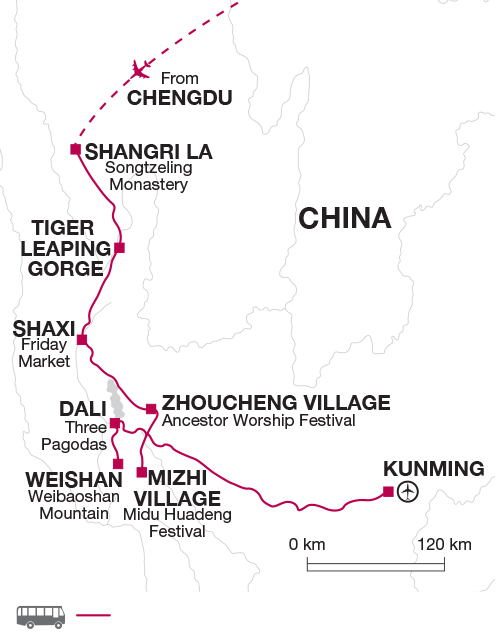 This trip ventures into China's Yunnan province to witness annual festivals ran by minority tribes. As well as welcoming in Chinese New Year at Dejilin Monastery, we walk through the scenery of the Dramatic Tiger leaping gorge and see a remote part of China seen by few outsiders. Our tour begins this evening in Chengdu, the capital city of Sichuan Province. After a tour briefing the evening is left free to rest. This morning we head to the outskirts of the city to meet Chengdu's most famous residents, the giant pandas. The research centre opened in 1990 and covers an area of more than 90 acres. The resident pandas are said to be China's spoilt children and they spend their days relaxing in large enclosures whilst the staff bring them bamboo by the bucket load. The centre works hard to breed the pandas with the ultimate aim of releasing them back in to the wild. After visiting we head back to Chengdu to discover the Wenshu Temple. Built during the Tang Dynasty the monastery is home to more than 500 paintings and calligraphy exhibits as well as over 300 Buddha statues, including a rare jade Buddha bought from Burma in 1922. This evening we take the flight to Shangri La. Travelling by local public bus we start with the Songtzeling Monastery, known locally as the 'Small Potala' as it bears a resemblance to the Potala Palace in Lhasa. The monastery follows the Yellow Hat sect of Buddhism and is home to 500 lamas. After spending some time soaking up the peaceful atmosphere we stroll around the lake which sits in front of this beautiful monastery. Making our way back to town we walk through the old streets until reaching the temple marking the centre of the town. A short drive this morning takes us to Dejilin Monastery where we watch the New Year Celebrations. The New Year is celebrated from the 1st to the 10th of the first lunar month. For the first nine days people celebrate in their own villages and then on the final day a large community celebration is held around the monastery. The activities last most of the day and locals come to picnic in the grounds of the monastery, often singing and dancing to entertain the gods as they pray for good luck in the coming year. In the early afternoon we leave the monastery and drive to Tiger Leaping Gorge, said to be named after a local watched a tiger leap from one side of the gorge to the other to avoid crossing the river. After breakfast we take a short drive to Upper Tiger Leaping Gorge and then walk for approximately 30 minutes down towards the Yangtse River. During the walk there are views of the gorge which in some places is less than 30 metres across. We return via the same route. The path is mainly steps so a walking pole is useful. After our walk we will make our way to Shaxi, a small village on the Tea and Horse Trail and our home for the next two nights. On the way we stop at Jianchuan where we can see traditional houses of the Bai People. The Bais hold the colour white in high esteem and typically women wear white dresses with sleeveless jackets in red or blue with shoes embroidered in white cloth. Clothing is often adorned with Bai symbols for snow, the moon, flowers and the wind. This morning we will wander through the streets and village square of shaxi and visit the Xinjiao Temple before leaving the village through the east gate and taking a short walk across farmland to reach a small village. If we're lucky we'll meet with the locals and learn a little more about life in this remote region. We'll walk back to Shaxi village in the late afternoon. Leaving Shaxi this morning we drive to Shadenqing where we leave our bus and hike up Shibaoshan Mountain. The walk will take approximately three hours and follows a defined path, with sections of steps that can be steep in some places. During the walk we visit ancient grottos and small temples that dot the mountain. Leaving the mountain we drive to Erhai Lake before spending tonight in Zhoucheng Village, one of the biggest Bai villages in the region. On arrival we will visit the market where the locals trade rice and vegetables. We will stay in a small guesthouse whilst we are here, depending on the size of our group we may be split across two guesthouses. Today we witness the village's annual Ancestor Worship Festival. The villagers come together to worship the gods of the village, which can be a real person, an animal or a hero from history or folklore. The festivities begin at the village temple with lots of singing and dancing and then people parade through the village carrying statues of their gods to reach the main square for a performance of Chinese Opera. We will have dinner with the villagers tonight, either in the temple or at a local farmhouse. We start early this morning and travel approximately three hours to Jinli Village where we spend the day watching the locals celebrating the Midu Huadeng Festival - also known as the flower lantern festival. The festival originates from the Ming Dynasty and was a display of soldiers practising defence and attack moves. As there were no battles to be fought the displays transformed into dances and now villages from all around come to display their unique dances. Often costumes are animal themed with many dragon, lion and cranes being depicted. This morning we watch some more dances from the Midu Huadeng Festival. After lunch we will drive to Dali, set on a lake with a beautiful mountain backdrop. After breakfast we travel back to Zhoucheng Village to see the final part of the Ancestor Worship Festival. The villagers carry statues of their gods from the village square back to the temple where they will remain until next year's festival. Returning to Dali we will visit the ChongSheng Temple, the largest Buddhist Temple in the area and home to the Three Pagodas which are over 1000 years old and Dali's most famous landmark. Today we drive to the town of Weishan, another major Bai town. We will explore the old section of the town whihc was once the ancient capital of the Nanzhao Kingdom and former stop on the old Tea and Horse Road. In the afternoon we drive approximately 12 kilometres out of town to Weibaoshan Mountain where we follow a path to the Taoist Temple and Ancestor Temple of the Yi People which are built in the forest. We follow good, paved paths but there are some steep sections and some steps. We head to Kunming today; a drive of approximately eight hours takes us to Yunnan's capital city. The city is large but with a very relaxed atmosphere and we will spend time exploring the town and its famous bird and flower market. Our tour ends in Kunming this morning after breakfast. Enquire The Adventure Travel Experts!